Rosebud County is in southeastern Montana near the Wyoming border. The town of Rosebud parallels the south shore of the Yellowstone River, ten miles east of Forsyth on Interstate 94 and Route 446. 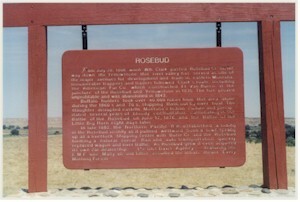 Rosebud County was formed in 1901 from part of Custer County. This area was explored by fur trappers and traders, with nearby Rosebud Creek (after which the town of Rosebud takes its name) especially popular for beaver. On July 28, 1806 William Clark & Company passed this area- Rosebud Creek in Montana. "From July 28, 1806 when Wm. Clark passed Rosebud Creek on his way down Yellowstone, this river valley was served as one of the major avenues for development and trade in eastern Montana. Innumerable trappers and traders followed Clark's route, including the American Fur Co. which constructed Ft. Van Buren at the juncture of the Rosebud and Yellowstone, in 1835. The fort proved unprofitable and was abandoned in 1843. Buffalo Hunters took over 40,000 robes from this area alone during the 1860's and '70's shipping them out by river boat. The slaughter disrupted eastern Montana's Indian culture and precipitated several years of bloody confrontation, culminating in the Battle of the Rosebud on June 17, 1876, and the Battle of the Little Bighorn eight days later." This is also near the spot where Lt. Col. George Armstrong Custer camped along the banks of Rosebud Creek on the way to his ultimate defeat at the Battle of Little Bighorn in 1876. North of Rosebud on MT 446, Far West State Recreation Area, along Yellowstone River, offers swimming, fishing, boating (a boat ramp is provided) and tent camping. This 3,000-acre Eastern Montana rolling prairie park preserves the site of the June 17, 1876, battle between the Sioux and Cheyenne Indians and General Crook’s soldiers. Remote, quiet, and undeveloped, the park includes prehistoric sites and the homestead and ranch of the Kobold family. Take your own food, your camera, and plenty of time to appreciate a slice of time and place. The population density was 2.0 persons per square mile in 1997, making Rosebud County a frontier county. The Northern Cheyenne Reservation is located in Rosebud County. The county's leading source of income is the electric, gas, and sanitary services industry. The county is served by a county health department located in Forsyth and a Board of Health. A link to wonderful Montana facts and places!